Starting an advanced job portal usually meant spending thousands of Dollars and months of work. With our Job Board theme and its 1-click install feature you can get started within minutes. It doesn’t get easier than Job Board to get your job portal online. 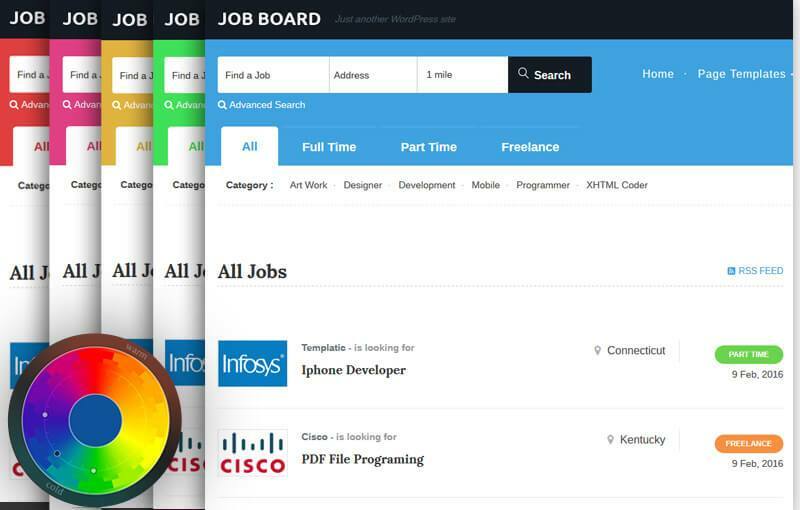 With these Job board themes, you can create job board sites like Indeed, CareerBuilder, etc. 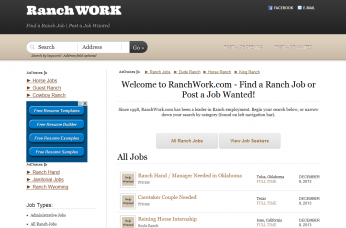 You can create an online jobs portal where you can allow front end users to post job listings. With these Job board themes, you can create job categories and subcategories. The registered employers to post their jobs under the relevant job category. 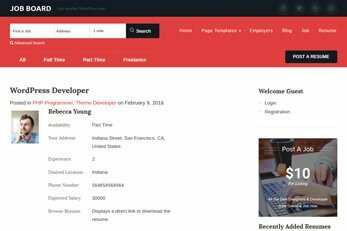 The job board WP theme is flexible. You can use it to create websites for Local recruitment agencies for posting job vacancies or international recruitment companies. The job seekers can search jobs by location, category, salary, and keyword. 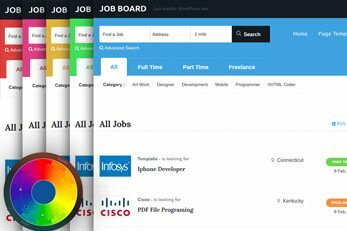 These job board themes can easily handle job posting and the resumes. You can use it for professional job board websites or build a site for freelancers. It promises a wonderful user experience for all. It ensures that the job hunters, recruiter & website administrators can easily find what they are looking. 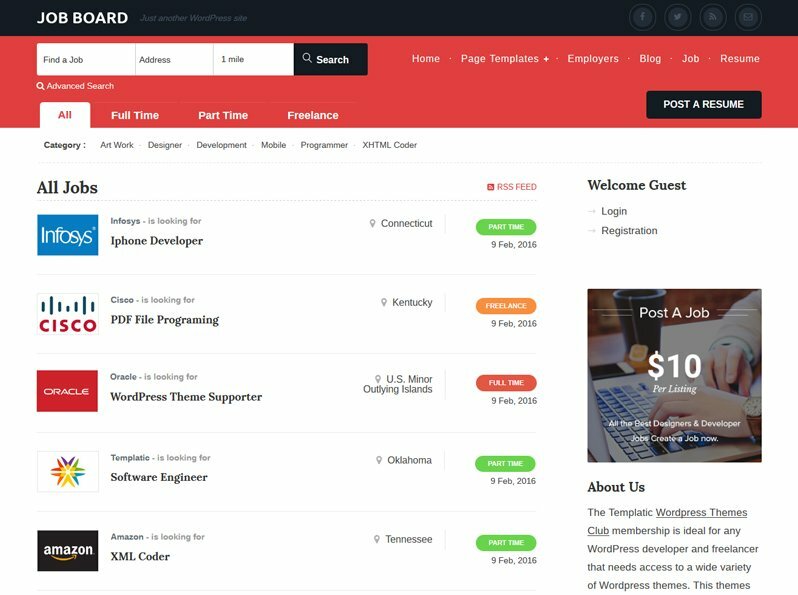 These Job board WordPress themes let you create unlimited job categories. You can create these job listing categories based on job types, location, etc. The choice is always yours. The users can choose the category and submit a job for it. Thus, the categories make it easy for your job board users to browse jobs on your website. Categories on your job board website facilitates job search and keeps the listings organized. 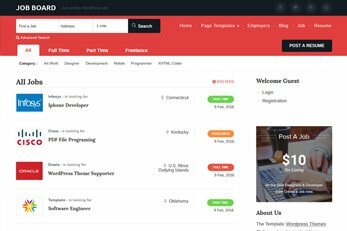 These directory style WordPress themes come with a pre-designed job listing page. Also, there is a fully functional listing submission form. 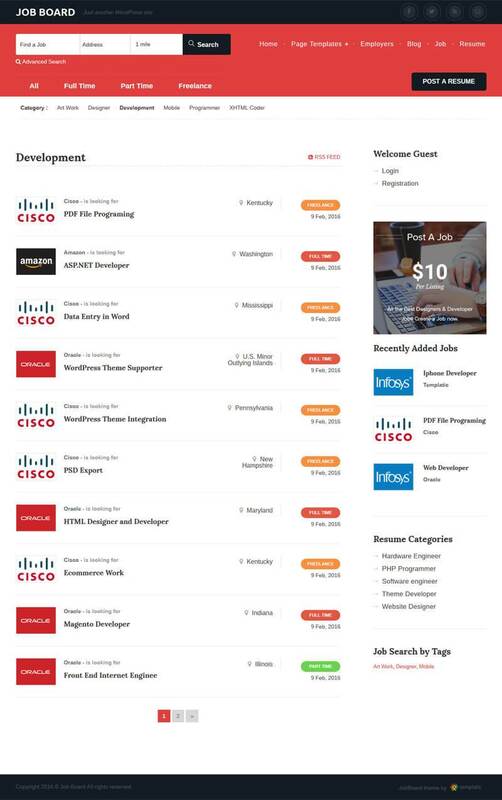 The job details are organized on the job listing page. We refer to it as the job listing detail page. This page is designed to help the job seekers view and process all the job details systematically. It displays all the important details about the vacancy like the company name, job locations, contact details, company logo, etc. The job board WordPress theme comes with a ready to use and fully functional job listing submission form. We have carefully crafted it to include all the fields required for a useful job listing. However, you may sometimes want to add new fields, remove the existing ones or update them. The Templatic Job Board themes allow you to manage the fields of the job listing post type. So you can add and update the fields. And those changes will be automatically reflected on the listing submission form. Create a job directory website that helps people find what they are looking for. The job portal themes listed here come with easy job search features. First of all, the classification of the job listings based on job categories can help the job seekers. They can find a list of the job listings of their relevance easily. Besides, there is the advanced search feature to make it more efficient. The filtered job search allows them to search jobs by location, category, salary, and keywords. Our job board themes have a simple as well as a filtered search option. 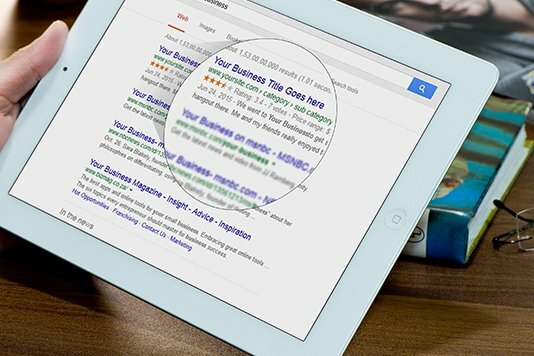 Simple search helps people enter a few keywords and find the results based on that. A job board website with filtered search allows you to choose from the filter options. So your visitors are only shown the jobs that are relevant according to the chosen options. The job board scripts for WordPress come with a resume upload support. This is a must-have feature for the ultimate online employment exchange. Any professional job board website allows resume upload. So this is one of the features that your users will appreciate. They can leave their resume on your website so that the employers seeking for candidates with a particular skill set can find them. When you create massive jobs website with multiple users. 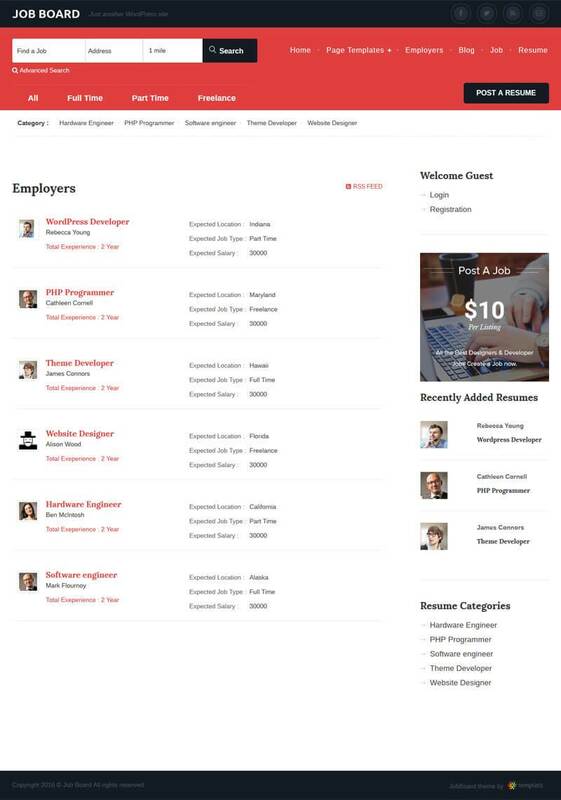 The companies and employers can register from the front end. So there should be a way through which you can the visitors can manage or update their profile on your website. This job board WordPress theme uses the WordPress’ inbuilt user management system. The registered users can log in to your account and update their profile on your job board. 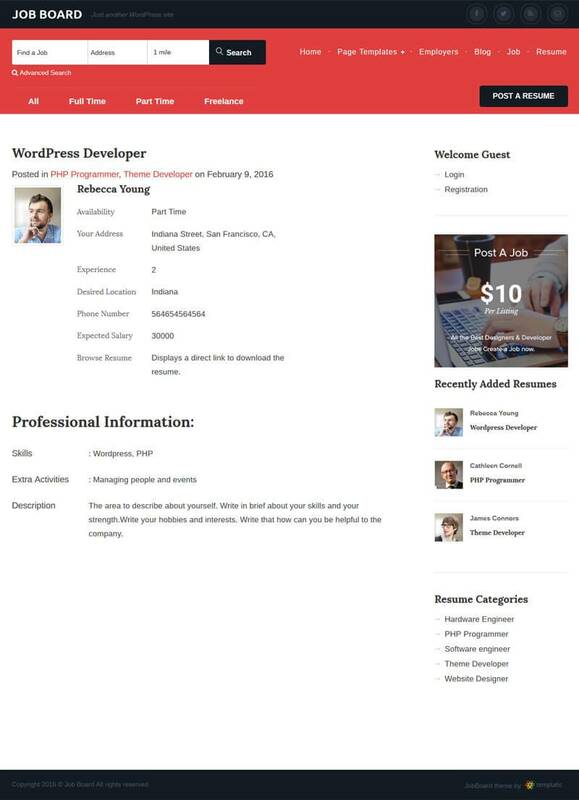 The job and resume submission forms are the most important part of any job directory WordPress theme. Using the back-end custom fields section you’ll be able to edit or delete the existing fields as well as add new ones. While creating new fields you’ll have access to multiple field types. These include various text fields, date pickers, select and radio buttons and multi checkbox. This adds great flexibility to the theme. It lets you create industry-specific fields on your job portal. Other custom fields capabilities include choosing a display location (front-end/back-end), whether or not the field is actually shown on the detail page and the ability to assign a CSS class. Creating a jobs portal which looks good on all mobile devices as well as on desktop gives you that extra edge. 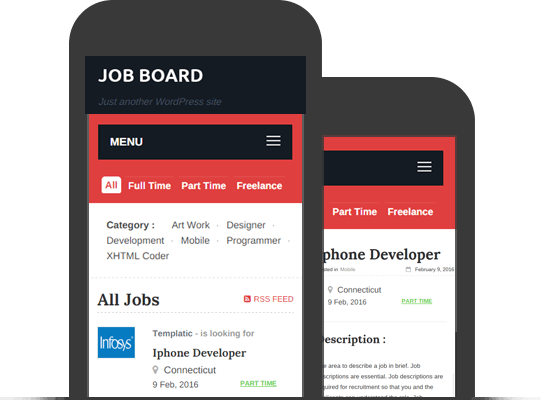 Not only will visitor from mobiles and tablets enjoy searching for jobs, a responsive theme will also help your SEO. 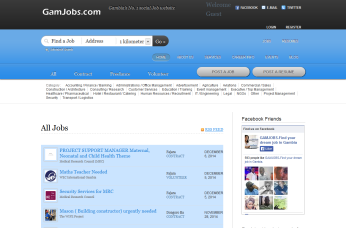 This powerful theme is ideal for job agencies, employers or job recruitment agencies to post vacancies online. The theme can also be used for job classifieds. So you as admin can charge for companies to post jobs on your portal. Take a look at how the theme looks on your mobile theme demo a try. You can now do an advanced search based on your choice. You can search jobs based on location, job type, category and so on. Packed with many features to make you money, this theme is built to put your earnings from a job board in 5th gear. JobBoard comes with several payment options including Paypal, Authorize.net, Worldpay, 2CO (2Checkout), Pre Bank Transfer and Cash On Delivery. 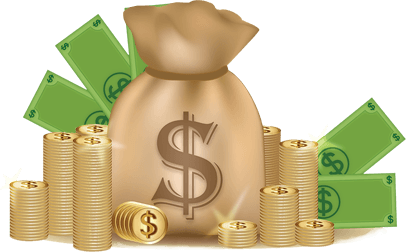 Below are some of the features designed to help you make money! Offer unlimited job submission packages. 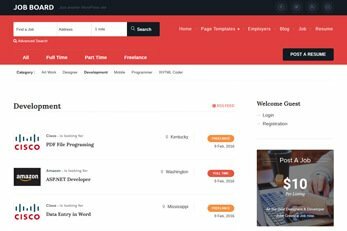 Offer homepage featured job posts. Offer category page featured job posts. Display AdSense or banner ads. Templatic’s job-related themes for WordPress can be used to create different types of job-based websites. The websites can have different scopes and usability. You can create job boards dedicated to a company, institution, university, etc. These job boards will display the vacancies of that particular institution only. Such job boards are useful for big companies, industries or educational institution where they declare vacancies constantly, in different departments. 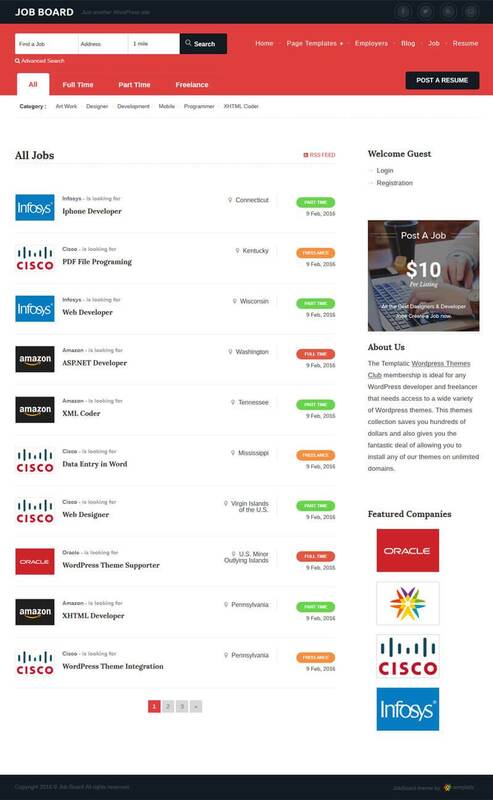 This kind of job board websites helps people find the jobs of a certain type. For instance – a website for all the writers where people looking for copywriter, bloggers, proofreader, editor, etc. post their requirements and the writers can find the jobs according to their skills. Or a website that helps the freelancing artists, writers, programmers and graphic designers to find their job. Whereas, those looking for With our job board themes, creating such websites becomes simpler and easier. A job board website is a feature-packed where the employers post the jobs and the job seekers find the jobs. In other words, it is a portal of jobs where people can post/find jobs. The Job themes here are the best WordPress themes for Job portals. You can create a money-making job board where you charge the employer to register and post their jobs. Create different categories where the employers can post. The scope of such job boards is generally spanning all the categories (or at least a large number of categories). The job seekers can find their jobs and upload their resume on your website. A website for freelancers or short jobs website. These types of website users are freelancers or people who are looking for short-term jobs. The people who want their work done by these professionals can post their jobs on such website. These websites generally display jobs for multiple professions. These jobs are short and not for long-term, commitment. The contract between the employer and employee ends, as soon as the work is completed. Your job portal obviously needs to be found online for it to be a big success. This theme is coded with the best of SEO practices. This theme also supports the best SEO plugins available today. So integrate plugins like Yoast SEO, All In One SEO, Google XML Sitemaps and All In One Schema.org Rich Snippets. You can customize this theme very easily from the dashboard. 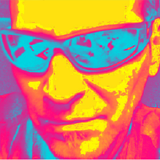 You can for example change colors to match your websites color scheme. There are also many setting and options which you can tweak straight from the dashboard. All of our themes are highly customizable. You can use the easy backend options to manage how your website looks. Apply basic customization like changing the color of the website, fonts, background, etc. Also, the admin dashboard options for the theme are arranged to make it easy for users to find the setting options to make the changes. Besides all of that, you get access to our complete guide on how to use a theme when you buy the theme. However, the learning curve for this WordPress job board software is almost nil. Now no need to hire experts or programmers to get your job board created. Use for purpose of your choice – Job search, freelancers, company’s employment exchange, etc. The Templatic job board themes are flexible and they can be used for different purposes. Even though they might appear as typical job board themes, they can be used for various other niches. You can create a jobs directory for displaying location-based jobs, or you can create a jobs junction website where people can find jobs based on their skills. With the intuitive theme management options available at the backend, you can control the scope of your website. So whether you want to create a subject-oriented jobs directory or a general job board website, you can create it easily. You can use these flexible WordPress job board themes for creating a job board with the closest functionality to Craigslist. You can create a website like HireBee or Freelancer Engine. 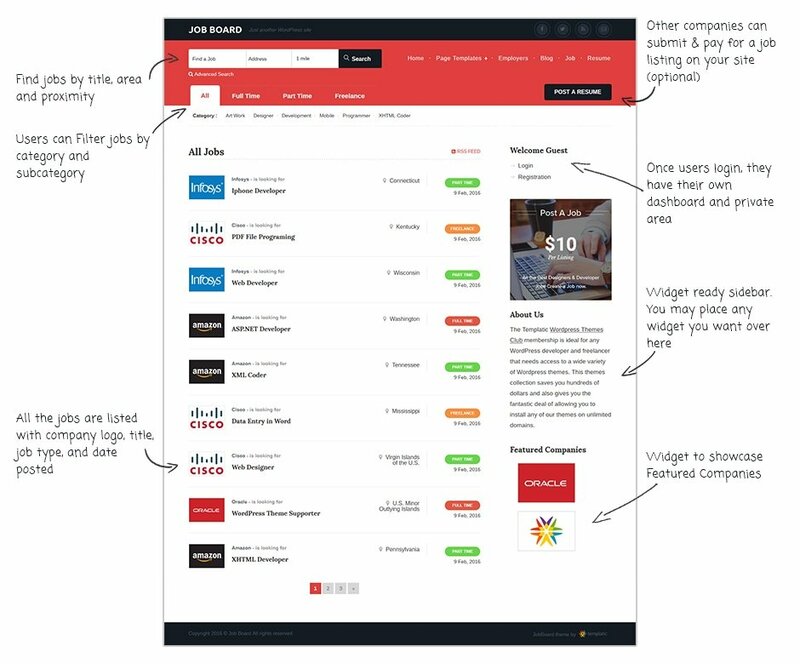 Even though the Job board themes are not specifically designed as a freelance engine template, you can create a freelance service marketplace with a little customization. These Job templates are ideal for staffing companies, and recruitment agency or build a website for short-term contract work. The job board theme comes with a front-end submission system as well as the approval option of admin on job post. By introducing separate post types for jobs and resumes JobBoard ensures all content is logically structured. Create categories for both resumes and jobs! The easiest and best way to make money with JobBoard is to charge for job submissions. Flexible submission packages and you can create as many of them as you need. Organize jobs in several job types. By default these include Full Time, Part Time and Freelance. You can also add new ones. 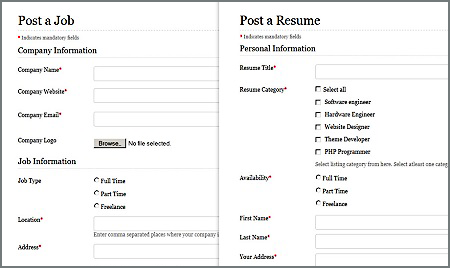 You can modify each field you see inside the job or resume submission form. Creating new ones is possible as well. 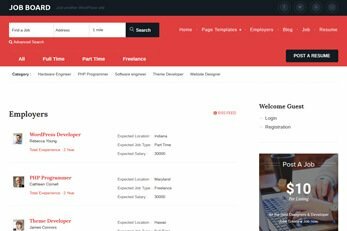 JobBoard comes with two new user roles; Job Seeker and Job Providers. Based on these roles certain parts of the theme will be unavailable to certain members. 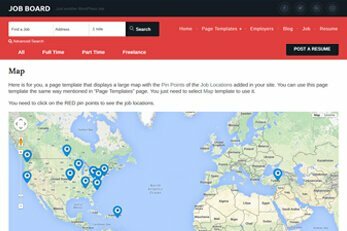 Enter the job location and the theme will display a map on job detail pages. 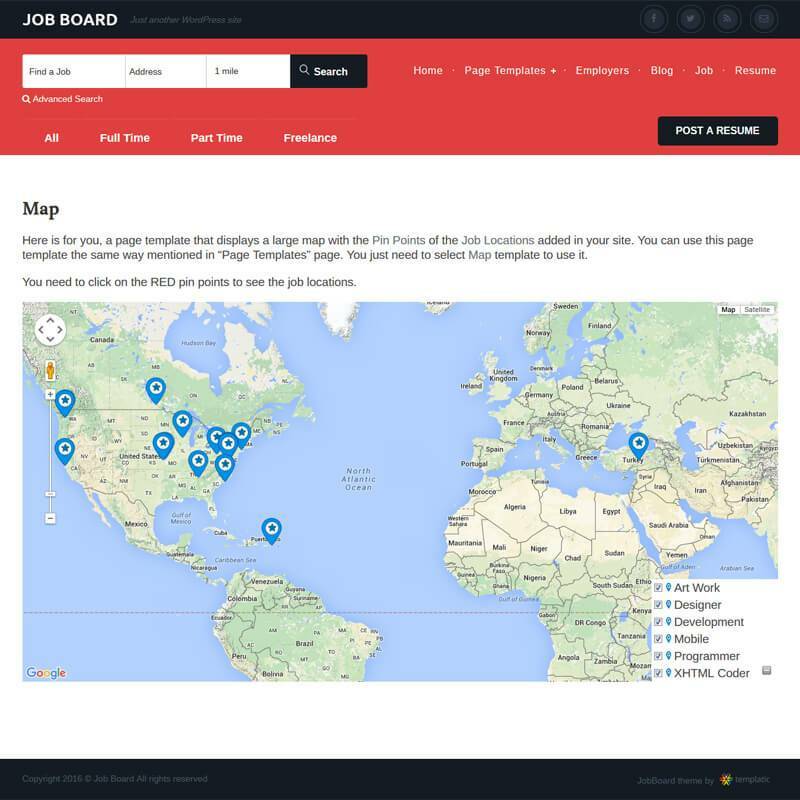 Creating a job listings map is also available via a dedicated page template. JobBoard comes with payment gateways, like PayPal, Authorize.net, WorldPay and 2Checkout, included. Offline methods are available as well. Jobs and resumes that your visitors submit can either be published automatically or held for moderation. It’s totally up to you to decide. No worries, we didn’t forget about the blog. You get a built-in blog with this theme too. Starting a blog with this jobs theme is as easy as creating a new category and adding some posts to it. Create discount offers on your price packages using the included coupon module. This will for sure come in handy early in the sites’s life-cycle. Any professional job board website has a feature for the visitors where they can register by providing their basic details and upload their resume to be found by the employers. So this is one of the features that your users will appreciate. They can leave their resume on your website and you can provide it to the employers seeking for candidates with a particular skill set. Even though the themes are extremely easy to use and intuitive, if you ever need assistance in setting up your website using our job WordPress theme, you can ask for the support team’s help. 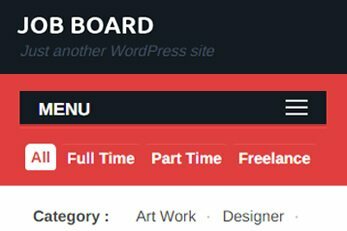 These job board WordPress theme comes with a theme guide which is essentially like a software user manual. The guide contains all the setup and use steps documented with relevant images. In our theme guide, we try to cover everything beginning with the theme installation to customization. A job directory website is a complex niche and sometimes setting it up can prove to be a little tricky. If you face problem while using any of the theme features, you can get in touch with our support team. You can submit your query using this form. The support executive will reach you out with the solution, earliest possible. Click on these websites to see how they have used the Templatic Job Board Theme to take their platforms to the next level! How can I Monetize my job board website? Managing and maintaining a job board website certainly needs more efforts than a simple business website. Therefore, expecting some reward for your efforts is only natural. Therefore, these job board themes listed here come with more than one ways to help you earn through your website. Allow your users to submit their jobs using the front end submission form. You can create any number of payment packages with different features and validity. Create your own payment plans and easily implement them by specifying the price and the number of posts allowed to be submitted under that package. You should even specify the validity of each post once submitted. The front end users can create their account and choose from one of the payment packages created by you. They will be allowed to submit their listing once the payment is successful. Can I use this Job board theme only with backend submission? Yes, the Jobs WordPress themes are flexible and easily manageable. 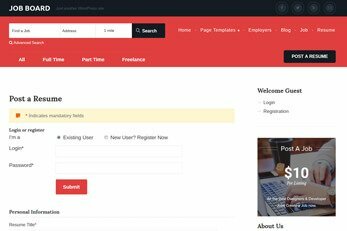 If you don’t need the front end submission system or the paid submissions on your website, you can easily disable them and create a job board website without front-end job posting system. Can I allow my users to post jobs on my Job board website for free? Yes, you can create a free payment package with the price zero. Name it as per your requirement. When the visitors choose this payment package, they will be able to proceed with job posting without being redirected to the payment portal. 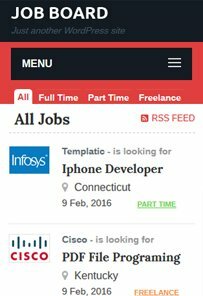 Does any of these job boards push jobs out to the main job boards like indeed.com, etc? No, currently none of our job board WordPress themes have the feature to push out or pull in the job listings from the popular job listing websites. However, we may consider them for our future updates.